The original version of this article, by Lisa Palmer, appeared on Slate. Technically, farmers today grow enough food to feed everyone. But nearly one billion people on the planet periodically go without eating, in most cases because the food is too expensive or not available in the right places. That number could get a lot worse. The food problem isn’t linear. To prevent hunger, farmers would have to double food production by 2050 even though the population isn’t doubling. Income growth is driving half of the increase in the world’s predicted food consumption. As more people in the developing world get wealthier, they adopt diets rich in meat and dairy. And it takes 13 pounds of grain to make a pound of beef. Sources: Stanford University, UN Population Division. 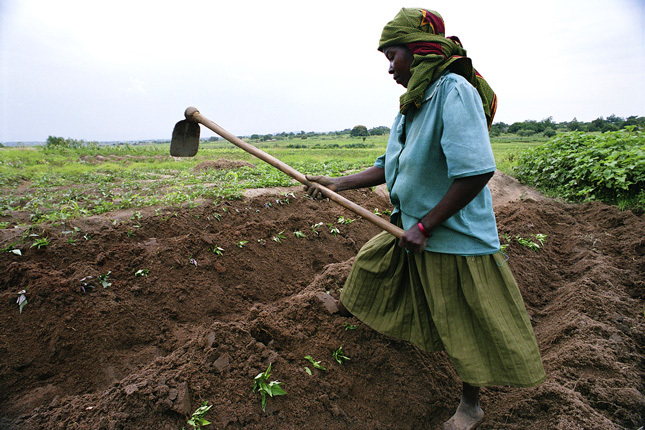 Photo Credit: A farmer in Tanzania tends her crops, courtesy of Scott Wallace/World Bank.